The United Arab Emirates Air Force (UAEAF) is the air force of the United Arab Emirates (UAE). Its predecessor was established in 1968, when the Emirates were still under British rule. Since then, it has undergone a continual reorganisation and expansion in terms of both capability and numbers of aircraft. Currently, the UAEAF has around 4,000 personnel and operates approximately 573 fixed and rotorcraft. The UAEAF's history starts in 1968, when the Abu Dhabi Army Air Force was formed under British rule. After becoming the ALRAMS Air Force in 1972, major investment assured an expansion in terms of capabilities, quality and quantity of aircraft. Training and instruction was provided by the Pakistan Air Force. Neighbour Emirate of Dubai maintained its own air component, the Dubai Defence Force Air Wing, until 1999, when the two were effectively merged to become what is now the United Arab Emirates Air Force. Although the integration of the two independent forces has been complete, a small degree of autonomy exists at the operational command level, with the Western Air Command being headquartered in Abu Dhabi and the Central Air Command in Dubai. Since the 1980s, a combination of regional instability and high oil prices has resulted in an ambitious modernisation of the UAEAF, with the goal of attaining a level of capability matching the highest NATO standards. In 1991 Gulf War, the UAE helped other countries by carrying out airstrikes against the Iraqi forces. In 2014, the United Arab Emirates Air Force along with the Egyptian Air Force carried out airstrikes in Libya against Islamist factions in Tripoli. In September 2014, UAE air force aircraft joined in US-led air strikes against terrorist targets in Syria and Iraq that later became known as Operation Inherent Resolve. These operations were suspended after a Jordanian pilot was captured by Islamic State militants in late December 2014; pending improvements in US search and rescue capabilities in the region. UAEAF crew chief communicating during an engine test at Nellis Air Force Base during Red Flag 11-2 on February 2, 2011. The UAEAF consists of about 4,000 personnel. In the 1970s and 80s, the UAEAF was instructed by Pakistan Air Force pilots on Dassault Mirage 5s, the backbone of the UAEAF at the time. Even today, many of the personnel are ex-Pakistan Air Force officers and technicians. Most of the flying instructors at Al Ain are from Pakistan, training pilots using Grob G 115, Pilatus PC-7, Aermacchi MB-339, and BAE Hawk 63 aircraft. A few officers of No. 12 Squadron (Hawk 102) at Al Minhad Air Base, are also from the Pakistan Air Force. Some of these officers are on deputation (active service), but most are on civilian contracts with the Air Force Headquarters in Abu Dhabi. Numerous officers of other nationalities have also trained UAE pilots, among them Pakistanis, Moroccans, Canadians, Jordanians, and South Africans. Women have started training as pilots. The first batch consisted of engineers given approval for flight training. So far, only three women have become actual fighter pilots and one a transport pilot. One woman pilot was grounded due to an ejection from a training flight in a Hawk 63. Instructors at Al Dhafra Air Base are now mainly from the US, as the UAEAF has retired its Mirage 5s in favour of F-16s. Currently there are five main air bases operational, split between the Western and Central Air Command. The Special Operations Command has its own airbase and operates a wide range of helicopters. Candidates apply to the Khalifa bin Zayed Air College, which is located at the Al Ain International Airport in Al Ain. They first go through a rigorous schedule of academics (Basic Level: Military Sciences), fitness and officer training. Those who are selected as cadets then start the second phase of academics: Flight Sciences (Aeronautical Science). Cadets who pass the assessment period of the second phase are designated aviation cadets and start flight training. The first aircraft cadets get to fly is the Grob G115 TA. Those who qualify then go on to fly the Pilatus PC-7. On this aircraft, they learn the basics of flying, take-off and landing techniques and procedures followed by a bit of aerobatics. Following the Primary Flying Course is the Basic Flight Course, piloting the Hawk 63. Graduates are graded and assigned accordingly to one of three options: the Advanced Strike course at Minhad on the Hawk 102 aircraft, transport aircraft, and helicopters. At Minhad, the new pilots learn Basic Fighters Manoeuvres, drop bombs and learn to fly cross-country to a neighbouring country, commonly Bahrain or Kuwait. Upon completion of the Advanced Strike course, officers are selected either for the F-16 (Block 60) or the Dassault Mirage 2000-9, both at Al Dhafra AB. A few pilots are selected to learn to fly the F-16 with the United States Air Force's 162d Fighter Wing in Tucson, Arizona. A UAEAF Mirage 2000 fighter. 2007 marked the culmination of the largest procurement programmes ever undertaken by the UAE Air Force, with the final deliveries of the 80 F-16E/F Block 60 "Desert Falcons" and approximately 60 upgraded Mirage 2000-9, giving the air force a considerable multirole capability. These two investments represented a total expenditure of around $10 billion, with additional money spent on infrastructure and logistics. A $6.4 billion contract with Lockheed Martin for the supply and support of the 80 F-16s was signed in March 2000, while a $3.4 billion deal for the purchase of 30 new Mirage 2000-9 and retrofitting of the 33 older UAE Mirage 2000s was signed earlier in 1998. Missiles were also purchased: 160 AGM-88 HARMs, 1,000 or more AGM-65 Mavericks, about 500 AIM-120 AMRAAMs, 270 AIM-9 Sidewinders and 52 AGM-84 Harpoons. In November 2017, the United Arab Emirates Armed Forces announced their intention to sign a contract with Dassault Aviation for the upgrade of its Mirage 2000-9 aircraft. French newspaper La Tribune reported the modernization would cost roughly €300 million. After a competition between the BAE Hawk, KAI T-50 Golden Eagle and Alenia Aermacchi M-346 Master, the UAEAF announced the acquisition of 48 trainer and light attack aircraft, with the first deliveries to take place in 2012. The other training types that are thought to be near replacement are the 30 Pilatus PC-7s and five Aermacchi MB-339s serving with the Air Academy at Al Ain. The MB-339 is also in use with the UAEAF flight display team, Al Fursan. The UAEAF has operated 20 IAR 330 Puma helicopters since the late 1970s. These have been recently upgraded to the IAR-330SM standard by IAR Ghimbav in Romania in cooperation with Eurocopter. These aircraft, supplemented by a further ten ex-South African Air Force reworked SA-330s, are expected to remain in service for at least 15 years. Although no replacement for the Puma fleet is required in the immediate future, the force will be supplemented by 26 Sikorsky UH-60M Battlehawks, with 390 AGM-114N Hellfire II missiles. 30 AH-64A Apache helicopters were modernised as well, to the AH-64D Longbow standard, and a dozen Eurocopter Fennecs were recently acquired for special forces use. The most important facility of the UAEAF is the Al Dhafra Air Base, with almost the entire fighter aircraft fleet located there. However, in order to prevent all of the air defence and strike assets being located at a single base, a $1 billion, completely new facility has been constructed deep in the Abu Dhabi desert, near the border corner with Saudi Arabia and Oman, near Al Gharbia, housing at least one Mirage 2000 unit. Al-Safran is believed to have opened between around 2008. It is 3,000 m long and has aircraft parking nearly the same size as in Al Udeid Air Base, Qatar. A 4,000 m runway at Al-Safran Air Base was built around 2008. Future programs include the Next-Generation Fighter, request for proposals has been sent to Boeing F/A-18 Super Hornet, Dassault Rafale, Eurofighter Typhoon, Lockheed Martin F-35A Lightning II and Sukhoi Su-57. "Force Report: UAE Air Force & Air Defence", AirForces Monthly magazine, January 2008 issue. ^ a b c d e AirForces Monthly, p. 60. ^ "Egypt, UAE carried out Tripoli air strikes: U.S. officials". Reuters. 25 August 2014. Archived from the original on 2014-08-26. Retrieved 26 August 2014. ^ "Libya crisis: US 'caught off-guard' by air strikes". BBC News. BBC. 26 August 2014. Archived from the original on 2014-08-26. Retrieved 26 August 2014. ^ Kirkpatrick, David; Schmitt, Eric (25 August 2014). "Arab Nations Strike in Libya, Surprising U.S." The New York Times. Archived from the original on 2014-08-26. Retrieved 26 August 2014. ^ "Background Note: United Arab Emirates". US Department of State. Archived from the original on 2009-09-04. Retrieved 7 September 2009. ^ "UAE eyes France's Rafale fighter". AFP. Archived from the original on 28 January 2010. Retrieved 7 September 2009. ^ a b AirForces Monthly, p. 61. ^ Tran, Pierre (14 November 2017). "Dassault to modernize UAE's Mirage fleet for a reported $350M". Defense News. Paris. Archived from the original on 14 November 2017. Retrieved 14 November 2017. 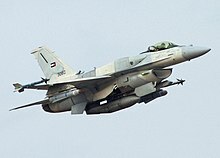 ^ "UAE Gives M346 a LIFT". Defense Industry Daily. Archived from the original on 2009-08-27. Retrieved 7 September 2009. ^ a b AirForces Monthly, p. 62. ^ "Eurocopter Romania awaits UAE contract". Jane's Intelligence Weekly. Archived from the original on August 7, 2003. Retrieved 7 September 2009. ^ a b AirForces Monthly, p. 63. ^ "UAE Ordering Weaponized UH-60M 'Battlehawk' Helicopters". Defense Industry Daily. 17 September 2008. Archived from the original on 2008-09-21. Retrieved 7 September 2009. ^ Osborne, Tony (2 April 2015). "UAE's Mysterious Airbase". Aviation Week & Space Technology. Archived from the original on 4 April 2015. Retrieved 4 April 2015. ^ a b c d e f g h i j k l m n o p q r s t u v w x y z aa ab ac ad ae af ag ah ai aj ak al am an ao ap "World Air Forces 2018". Flightglobal Insight. 2018. Archived from the original on 2018-02-06. Retrieved 1 June 2018. ^ "SIPRI Arms Transfers Database". SIPRI. Archived from the original on 2014-04-23. Retrieved 28 September 2017. ^ "GENERAL ATOMICS CONFIRMS UAE PREDATOR DELIVERY". militaryedge.com. 17 February 2017. Archived from the original on 2018-02-21. Retrieved 13 November 2018. ^ Biggers, Christopher (26 January 2018). "UAE revealed as Wing Loong II launch customer". IHS Jane's 360. Washington, DC. Archived from the original on 26 January 2018. Retrieved 26 January 2018. ^ "UAE awards contracts for CH-47 upgrade". flightglobal.com. Archived from the original on 2017-08-12. Retrieved 25 September 2017. ^ "World Air Forces 1983 pg. 374". flightglobal.com. 1983. Archived from the original on 2018-04-13. Retrieved 2 April 2018. ^ "defense-watch.com". ww1.defense-watch.com. Archived from the original on 2018-12-24. Retrieved 2019-02-04.